For starters Zoho is an online application suit including docs, mail, calendar, planner – just like Google Docs. It has launched Zoho Gadgets that allows you to access content of Zoho account within external applications like Facebook, Gmail, Orkut etc. 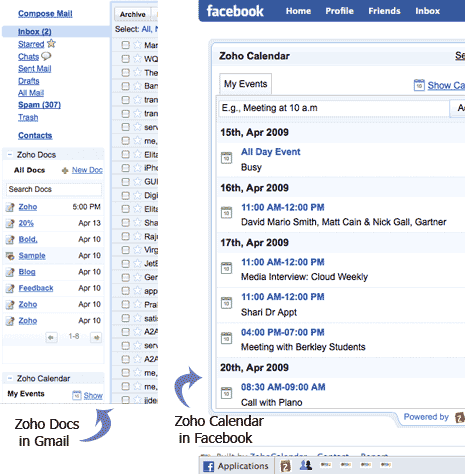 For example, you can see list of Zoho documents in the sidebar of Gmail , Facebook account and even your webpage or blog. To get started, just go to Zoho Gagets page [http://gadgets.zoho.com] and select the gadget for specific Zoho service among docs, mail, calendar etc. Click on Facebook, Orkut, iGoogle icons to embed and display Zoho contents on sidebar of respective services. Use embed link button to show gadget on your blog or website. To show gadget on Gmail sidebar, login into Gmail, goto settings > Gadgets and then paste Open Social XML URL as displayed on Zoho Gadgets webpage. This new feature will make Zoho more accessible and attractive while we use our other favorite web services like Gmail, Orkut, Facebook etc. Embed Zoho Gadget and stay updated with content of your Zoho account.